Now that the temperature has plummeted (it will be 17ºF this evening), I have an excuse to layer my clothing. Personally, I love sweaters, scarves, hats, gloves and overcoats. So much so that I’ve bought the now well-provisioned Mrs. E. a number of each of them. They are all stored in the closet, little used. Mrs. E., as you may recall, is from South America. Layering is a concept that is a bit foreign to her. Actually winter is a concept around which she cannot wrap her otherwise prodigious brain. Lately, Mrs. E.’s outlook seems to have been vindicated. We’ve heard that we are not supposed to bundle up when wearing our seat belts in the car. So the kids are out in sweaters and windbreakers (we keep lap rugs in the car for them) and we dash about in scarves, gloves and sportcoats. Or at least I do. Often with a hat, which is seen as faintly ridiculous and extravagant. I miss commuting by metro. The car caused the death of the greatcoat and hat. Travel by rail and you see people in overcoats, hats, galoshes and all manner of soon-to-be-arcane outerwear. Here in Richmond, the distinction between city and country clothing has all but disappeared with most people climbing into the SUV in fleece pullovers or Barbour quilted jackets. You may spot a leather car coat or peacoat. But it’s unlikely. Greatcoats as they were once known, are today subdivided into two categories: overcoats and topcoats. 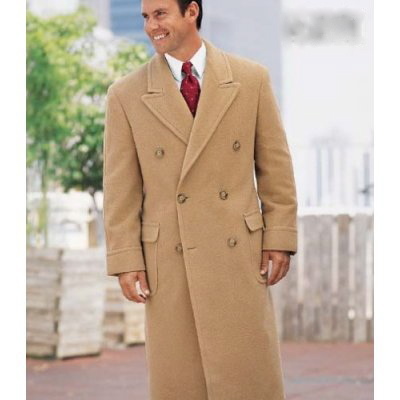 Topcoats are lighter in weight, overcoats, heavier. One of the most useful to find in your wardrobe is also one of the most elegant — the camel hair polo coat. Like many things, the polo coat began life as an article of sports clothing. Introduced to America from England (via India) by Brooks Brothers around 1910, the polo coat is traditionally double-breasted with a half belt at the back. Brooks Brothers sold it in white rather than camel colored. The coat started life on the polo fields of India and was a simple, belted thing resembling a bathrobe. It was worn by British Army players over their riding habits after or between chukkas to keep them warm. (A stylistic far cry from today’s warm up jackets, it is still about as comfortable to wear as your bathrobe.) The sleeves are set-in and the coat sports patch pockets. By the 1930’s, underclassmen at the Ivy League schools had adopted the look. Women took to it even faster, according to the Brooks Brothers website, snapping up the coats in the 1920’s. That was the same decade that British polo teams began playing in Long Island matches… Stylish women couldn’t have failed to notice the elegant nonchalance that the polo coat imparts. As an elegant addition to your everyday wardrobe, the polo coat is hard to beat. That combination of sporting heritage, dressy fabric and soft tailoring is always a winner. So, will the polo coat make a reappearance in today’s casually dressed, centrally heated, and automobile-centric world? Me? I throw mine across the passenger’s seat when I get into the car and across my shoulders when I get out. Or it goes across my children’s laps when I strap them into the car seats. Sometimes I even throw it over my pajamas when I step outside first thing on a winter’s morning. And, yes, Mrs. E. has one, too. This entry was posted in Elegantology, Living and tagged clothing, Elegantology, outerwear. Bookmark the permalink. 6 Responses to Polo Anyone? A polo coat from Brooks Brothers is the first sign of adulthood. It is the chicest article of clothing a man can or should own. Well, that and maybe croc loafers. I remember a blonde woman with a black ponytail holder, jeans, a turtleneck, boots and tortoiseshell sunglasses who wore one very well indeed. And the coolest kid I taught to fence during my school days wore his to great effect. Hard to pull off dashing in college, but he did. I’ve managed to get ahold of the coat, but the loafers are still the stuff of dreams! What a wonderful, wonderful post. My husband is so into clothes, much more than I am – I’m going to forward this to him to read, he will really appeciate the article. Great history – I had never read such a detailed account of the coat! Thanks for your comment, too. A pleasure. And thank you! Hope your husband enjoys the post. Love the outfit you described on the blonde. That’s me, except I am not blonde. I used to have RL croc loafers and I wore them to pieces. I hope you kept them for bedroom slippers when they had all but given out!